Can you believe that Christmas is next week? If you celebrate, do you decorate a Christmas tree? I love the tree tradition and I have several different ones in my house (including an aluminum tree with Star Wars ornaments!). 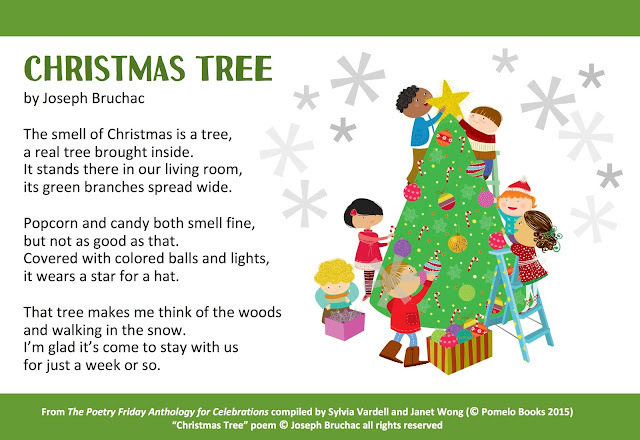 But this poem by Joseph Bruchac from The Poetry Friday Anthology for Celebrations captures the simple beauty of a live tree. 1. If possible, set the stage with the smell of a Christmas tree—with live branches, scented air freshener, or a pine-scented candle (if allowed). Then read the poem slowly with a pause after each stanza. 2. Read the poem aloud again and invite children to chime in on the repeated and crucial word "tree." 3. Work together to draw a picture or create a collage of a Christmas tree based on the details in this poem (green branches, colored balls, lights, star). Then read the poem aloud again together. 4. 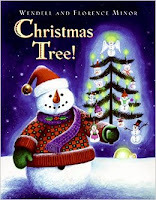 Pair this poem with the picture book Christmas Tree! by Florence and Wendell Minor (HarperCollins, 2005) and identify all the different kinds of Christmas trees pictured in the illustrations. 5. 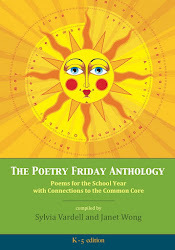 Match this poem with “Oh Summer Books” by Diana Murray (June, pages 162-163) because of the tune connection (“O Tannenbaum”), “Tree Day Celebration” by Ibtisam Barakat (April, pages 104-105), and poems from Winter Trees by Carole Gerber (Charlesbridge, 2008), or link to Christmas poems with Manger edited by Lee Bennett Hopkins (Eerdmans, 2014). This is just one of a dozen December holiday poems from The Poetry Friday Anthology for Celebrations. Of course we also have poems for Chanukah, Boxing Day, Kwanzaa, and New Year's Eve, too, among other special occasions this month. 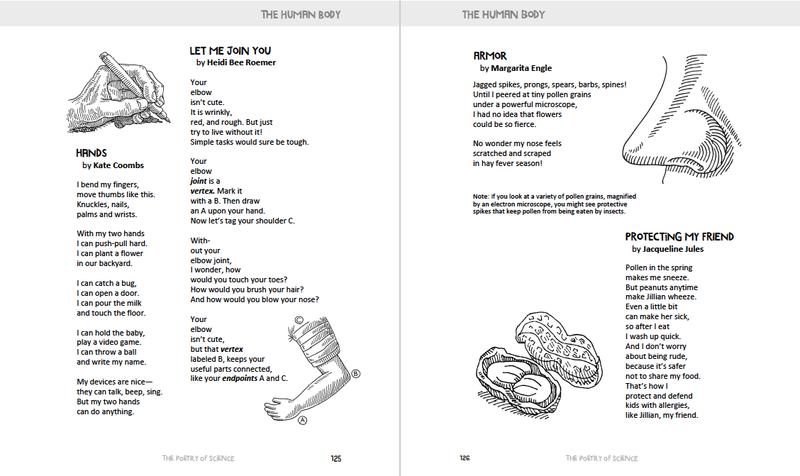 And of course we have even more poems for a dozen holidays in EVERY month of the year, January through December. Get your copy now and be ready for 2016! 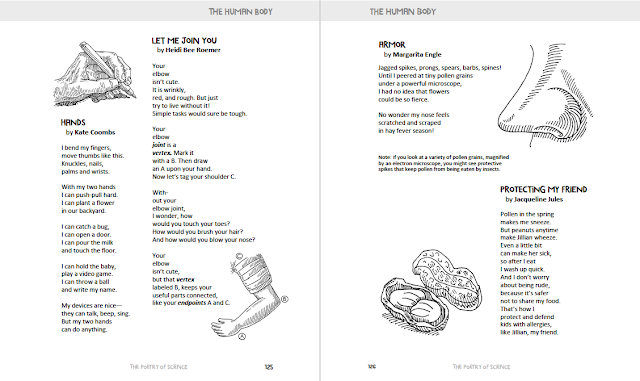 Meanwhile, join the Poetry Friday fray over at Random Noodling where Diane is hosting the festivities! Various sources claim that either December 12 or December 13 is National Cocoa Day. Here in Texas it's warm again (near 80 degrees! ), so it's not exactly ideal cocoa drinking weather, but I am going for it anyway. 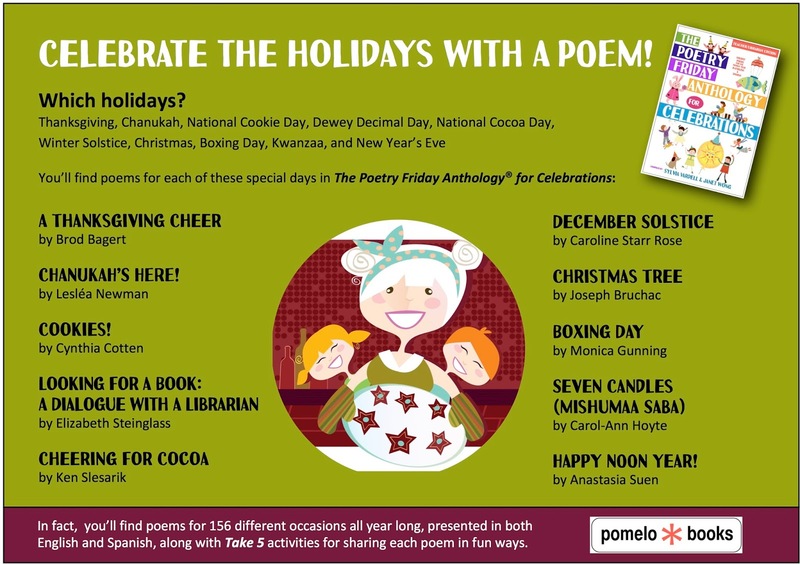 I love hot cocoa, so I was happy to see this "holiday" exists and we thought it would be a fun one to include in our anthology, The Poetry Friday Anthology for Celebrations. Read it now or save it for a chilly day! 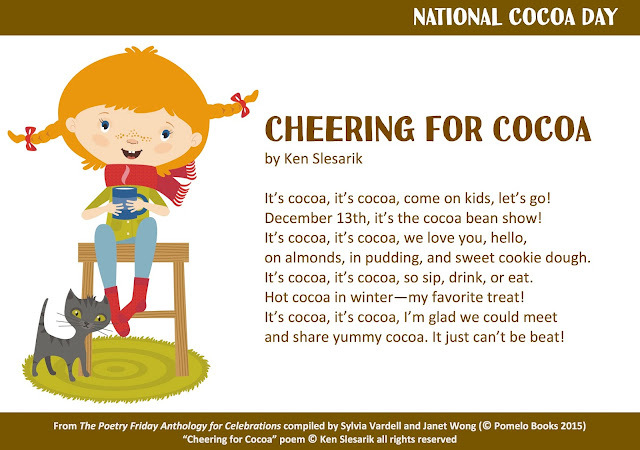 As your poetry prop, hold a mug as if it were full of hot cocoa and read this National Cocoa Day poem aloud with enthusiasm. Share the poem again and invite children to chime in on the repeated phrase It’s cocoa, it’s cocoa while you read the rest of the poem aloud. Hold up your mug to cue them. Use details from the poem to work together and make a list of things that contain cocoa. Another resource is TheStoryofChocolate.com. 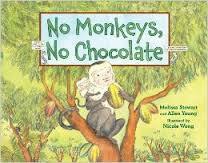 Pair this poem with the picture book No Monkeys, No Chocolate by Melissa Stewart (Charlesbridge, 2013). Talk about where cocoa comes from and how the interdependence of rain forest plants and animals is essential to its growth. 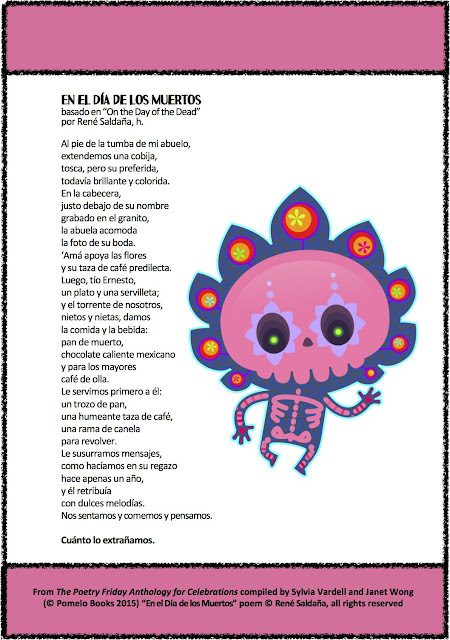 Connect with “On the Day of the Dead” by René Saldaña, Jr. (November, pages 292-293) and with selections from ¡Yum! ¡MmMm! ¡Qué Rico! : America's Sproutings by Pat Mora (Lee & Low, 2007) and The Popcorn Astronauts and Other Biteable Rhymes by Deborah Ruddell (McElderry, 2015). 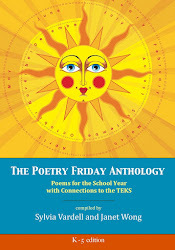 Now check out the Poetry Friday fun over at A Teaching Life where Tara is hosting the party! 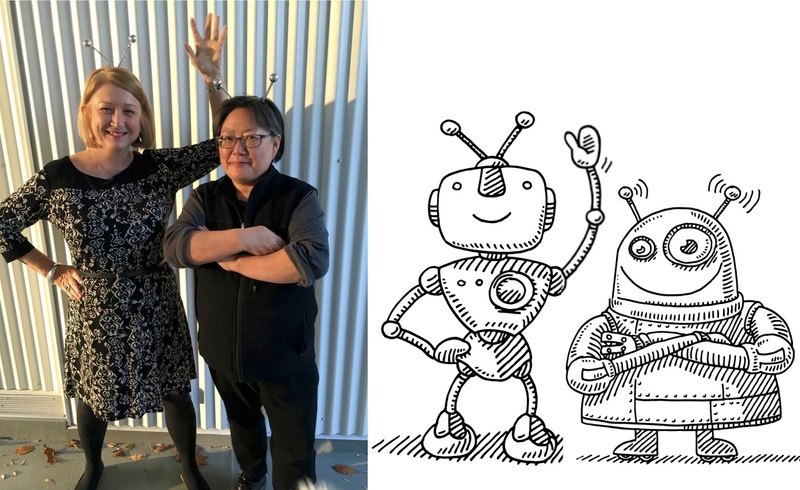 Janet (Wong) and I are so excited to announce the launch of our latest venture! (Yes, that is Janet being excited!) 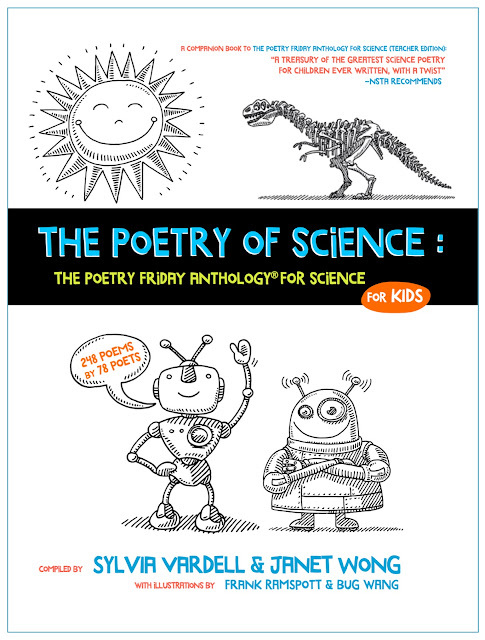 It's The Poetry of Science: The Poetry Friday Anthology for Science for KIDS. 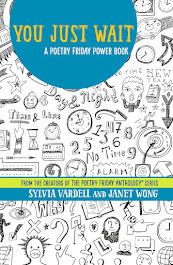 This new book features 248 poems by 78 poets, along with illustrations by Frank Ramspott and Bug Wang. It's arranged thematically by science topics such as what scientists do, the science fair, classroom science, kitchen science, matter, earth & sun, space & sky, water, weather, surviving disasters, land & soil, ecology & conservation, endangered & extinct, the human body, engineering, computers, math, and the future. 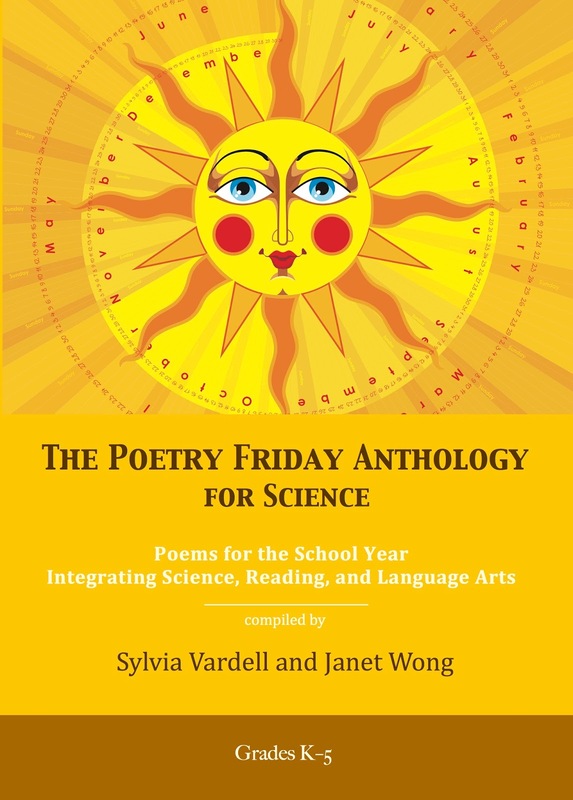 This is the companion volume to The Poetry Friday Anthology for Science for teachers published last year (2014) which includes "Take 5" activities for each poem. 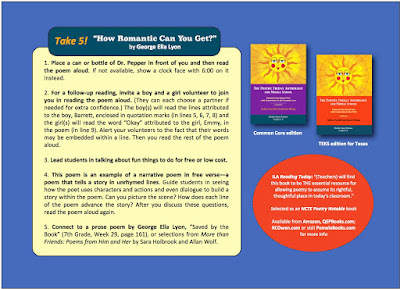 The new "remix" features ONLY THE POEMS and not the "Take 5" teaching activities. 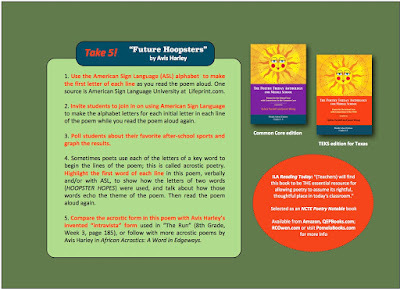 Plus, it offers 30 "bonus" poems not featured in the teacher's edition. Here's a sample double-page spread. You can find more sample poems from the book at Pinterest here. 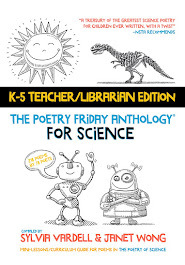 Below is the cover of the "Teacher Edition" of The Poetry Friday Anthology for Science for teachers (2014) which includes "Take 5" activities for each poem aligned with the Next Generation Science Standards (as well as the CCSS and TEKS). 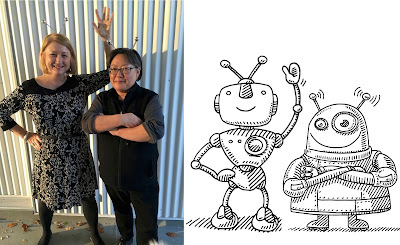 And just for fun, did you notice that the robots on the cover of the new book look a tiny bit like Janet and me? 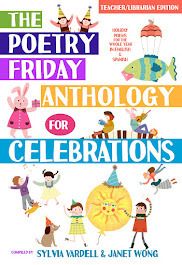 And don't forget our "celebrations" anthology with perfect poems for many December holidays including a December birthday poem for people like me who have birthdays during this holiday time! What an amazing group, right? 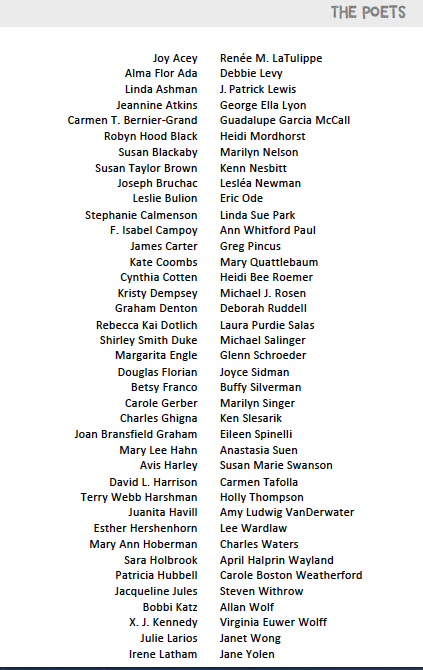 Time again to pause and think about the many things we are grateful for in our lives-- like this online community of poetry lovers, for example. Thank YOU for continuing to support my little blog and the field of poetry for young people all around. What a privilege it is. But I always like to balance the serious with some silliness too. 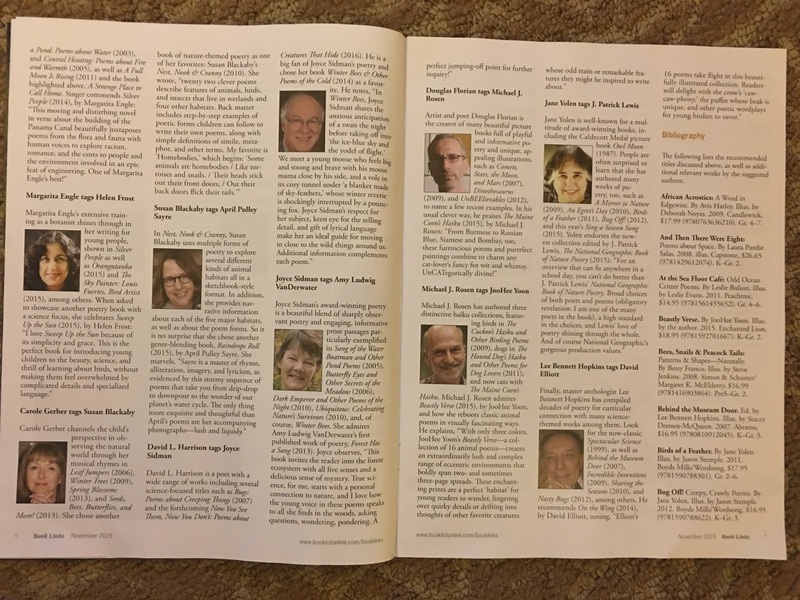 So, I hope you'll indulge my sharing this nutty Thanksgiving-themed poem from The Poetry Friday Anthology for Celebrations (with thanks to Brod Bagert, too). The "artistic" interpretation, however, is mine (with thanks to Matt Groening). 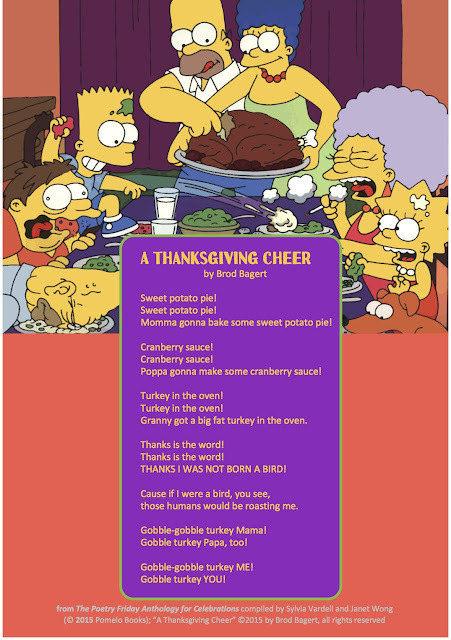 Before reading the poem aloud, ask children to close their eyes and envision a Thanksgiving gathering and meal. Then read the poem aloud with enthusiasm. 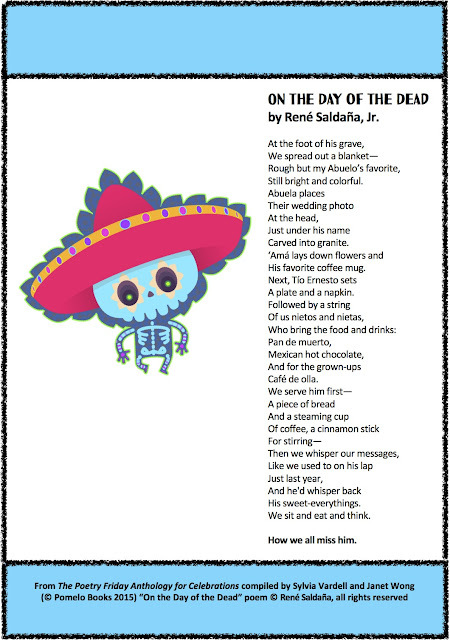 Read the poem aloud again and invite children to chime in on the second line of each three-line stanza (echoing you and the first line) and then on the final word, YOU! As a group, talk about favorite Thanksgiving foods and traditions. 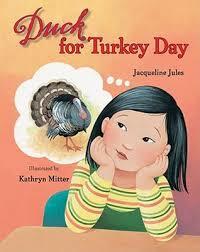 Pair this poem with the picture book Duck for Turkey Day by Jacqueline Jules (Albert Whitman, 2009) and discuss the many “right ways” to celebrate Thanksgiving. Connect this poem with “‘Break-Fast’ at Night” by Ibtisam Barakat (June, pages 180-181) and with selections from Thanksgiving Day at Our House: Thanksgiving Poems for the Very Young by Nancy White Carlstrom (Aladdin, 2002) and Holiday Stew: A Kid’s Portion of Holiday and Seasonal Poems by Jenny Whitehead (Henry Holt, 2007). 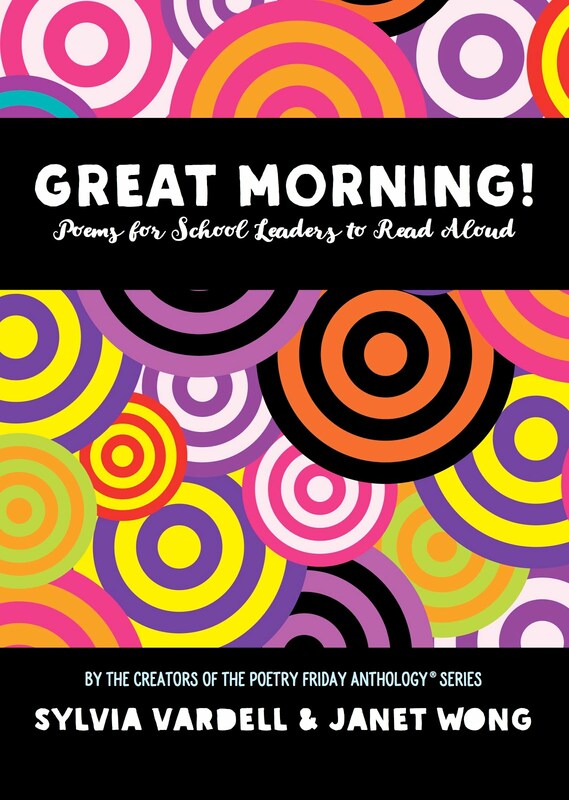 And don't forget to check out the rest of the Poetry Friday fun over at Miss Rumphius where Tricia has a bit of Robert Frost to share! 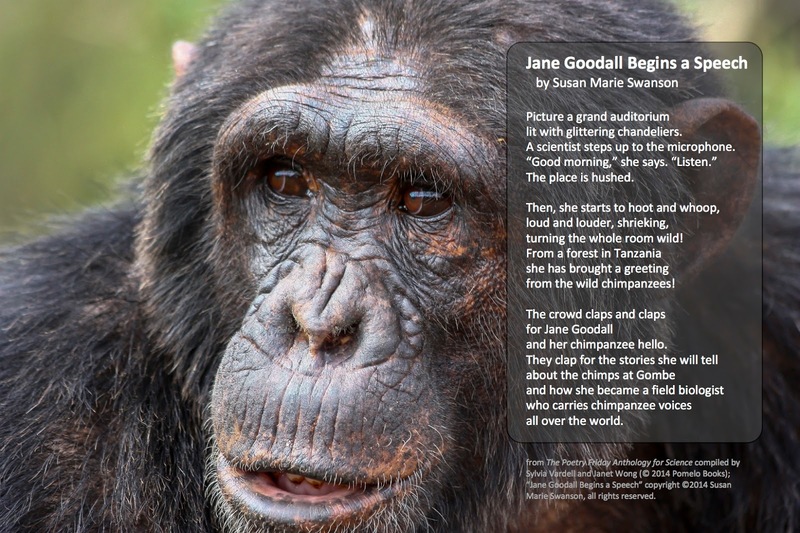 And of course we had to share this 13 second video of Jane Goodall herself making the chimp call! Also this poem offers a perfect transition to NEXT week's presentation at the annual conference of the National Council of Teacher's of English. 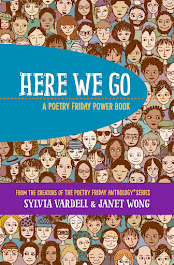 Next week, Janet and I shift gears at join forces with poets and authors Susan Marie Swanson (who wrote the "Jane Goodall Begins a Speech" poem above) and Laura Purdie Salas to talk about poetry and movement, "Into the Poem: Active Strategies for Engaging Kinesthetic Learning." More on that next week! Meanwhile, head on over to Wee Words for Wee Ones for the rest of the Poetry Friday fun and enjoy our closing slide from our presentation, "How is a Scientist Like a Poet: Connecting Literacy and Science." 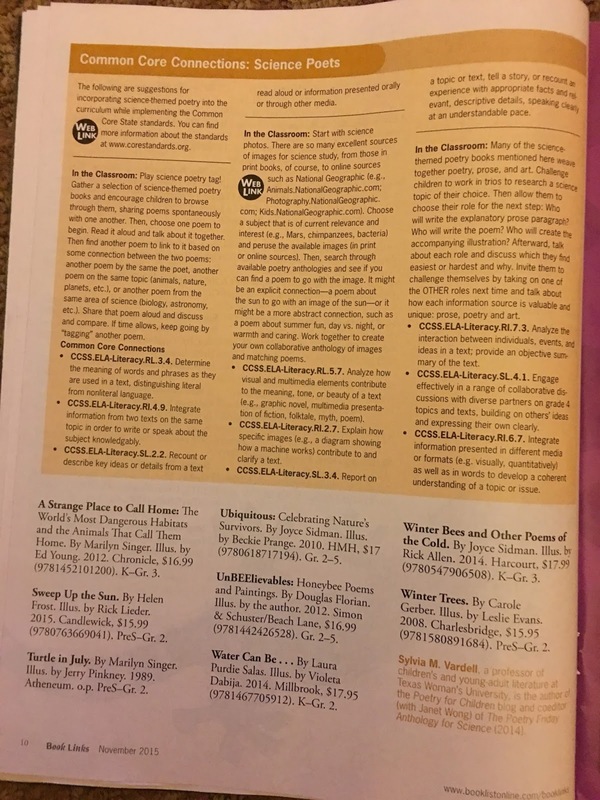 I just got my copy of the November issue of Book Links and I was so tickled to see that my usual poetry column was a featured article this time! Woo hoo! 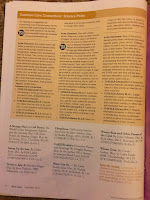 Thanks to the 15 poets who graciously collaborated with me to share favorite science poetry books. 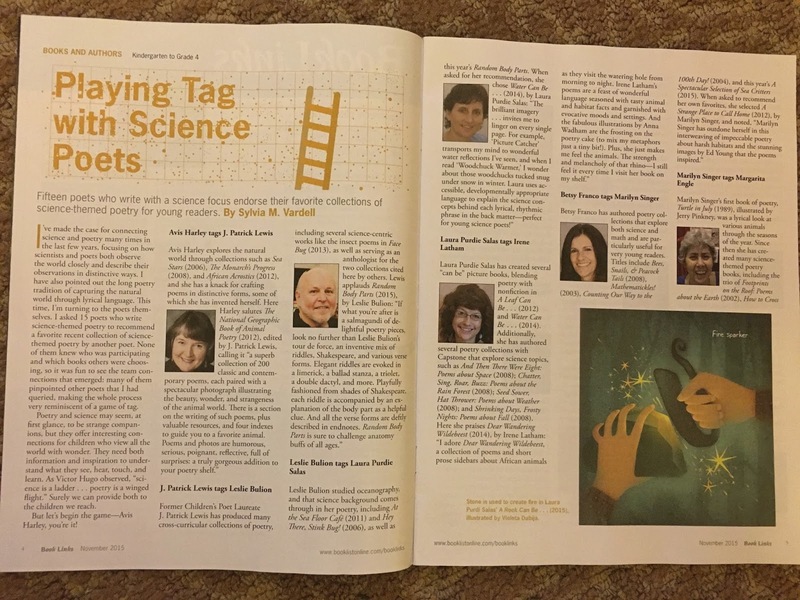 The title is Playing Tag with Science Poets" and these poets participated: Joyce Sidman, J. Patrick Lewis, Margarita Engle, Leslie Bulion, Jane Yolen, Marilyn Singer, Betsy Franco, Douglas Florian, Carole Gerber, Avis Harley, David L. Harrison, Lee Bennett Hopkins, and Michael J. Rosen. 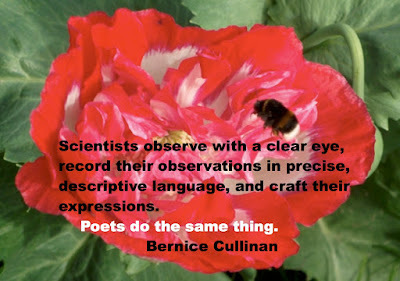 I’ve made the case for connecting science and poetry many times in the last few years, focusing on how scientists and poets both observe the world closely and describe their observations in distinctive ways. I’ve pointed out the long poetry tradition of capturing the natural world through lyrical language. So this time I’m turning to the poets themselves. I asked 15 poets who write science-themed poetry to recommend one of their favorite recent collections of science-themed poetry by another poet. And none of them knew who was participating and which book others were choosing, so it was fun to see the tag team connections that emerged. 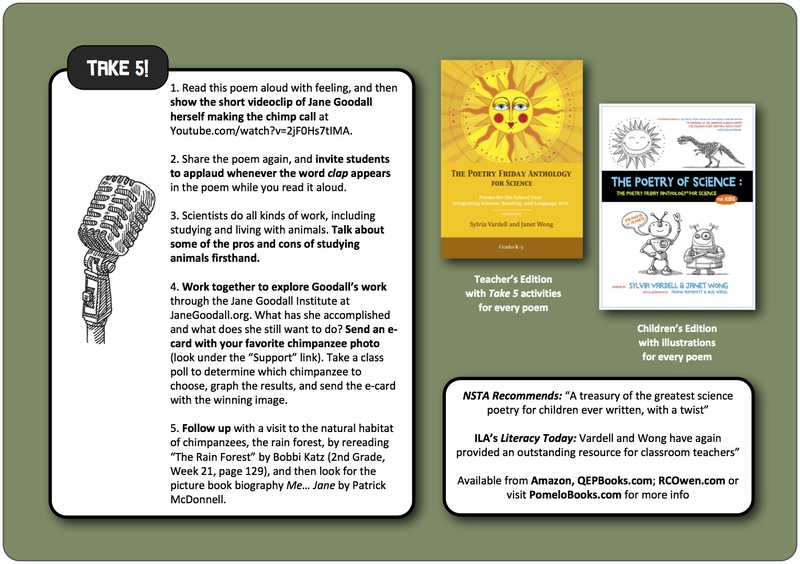 Poetry and science may seem at first glance to be strange companions, but they offer interesting connections for children who view all the world with wonder. They need both information and inspiration to understand what they see, hear, touch, and learn. 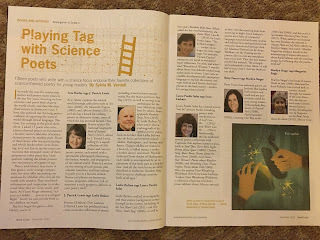 As the great novelist Victor Hugo observed, “science is a ladder... poetry is a winged flight.” Surely we can provide both to the children we reach. Avis Harley explores the natural world through collections such as Sea Stars: Saltwater Poems; The Monarch’s Progress: Poems with Wings, and African Acrostics; A Word in Edgeways, among others and she explores the natural world with a knack for crafting poems in distinctive forms, some of which she has invented herself! Here, Avis Harley salutes‎ The National Geographic Book of Animal Poetry edited by J. Patrick Lewis: “National Geographic’s Book of Animal Poetry edited by J. Patrick Lewis, is a superb collection of 200 classic and contemporary poems, each paired with a spectacular photograph illustrating the beauty, wonder, and strangeness of the animal world. 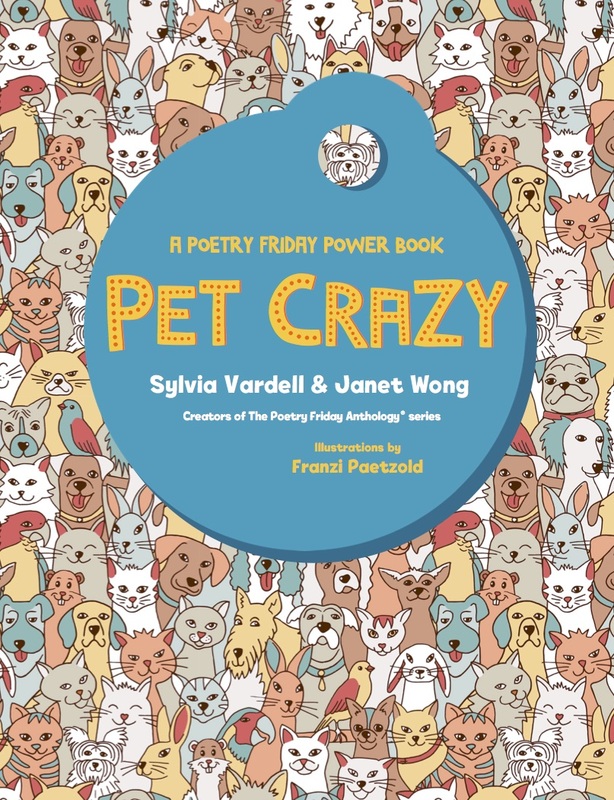 There is a section on the writing of such poems, plus valuable resources, and four indexes to guide you to a favorite animal. Poems and photos are humorous, serious, poignant, reflective, full of surprises: a truly gorgeous addition to your poetry shelf." 1. Play science poetry tag! Gather a selection of science-themed poetry books and encourage children to browse through them, sharing poems spontaneously with one another. Then, choose one poem to begin. Read it aloud and talk about it together. Then find another poem to link to it based on some connection between the two poems: another poem by the same the poet, another poem on the same topic (animals, nature, planets, etc. ), or another poem from the same area of science (biology, astronomy, etc.). 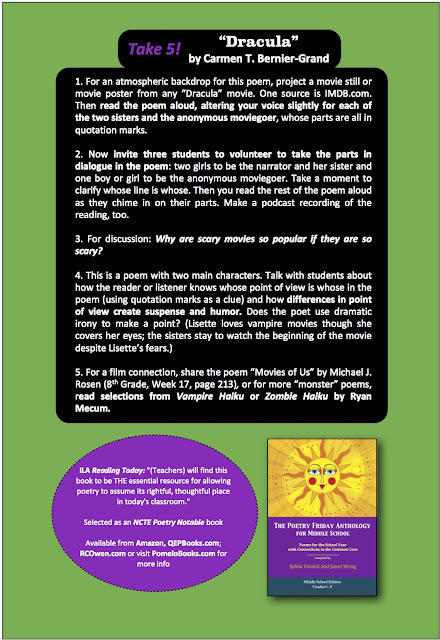 Share that poem aloud and discuss and compare. If time allows, keep going by “tagging” another poem. 2. Start with science photos. There are so many excellent sources of images for science study, from those in print books, of course, to online sources such as National Geographic (e.g., Animals.NationalGeographic.com; Photography.NationalGeographic.com; Kids.NationalGeographic.com). 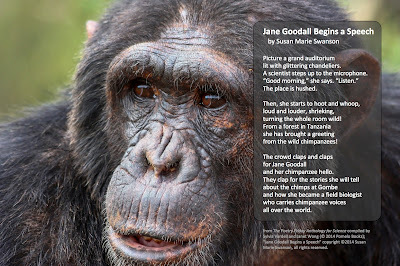 Choose a subject that is of current relevance and interest (e.g., Mars, chimpanzees, bacteria) and peruse the available images (in print or online sources). 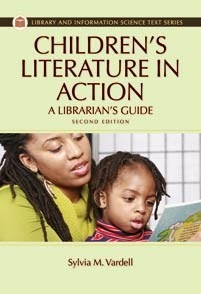 Then, search through available poetry anthologies and see if you can find a poem to go with the image. 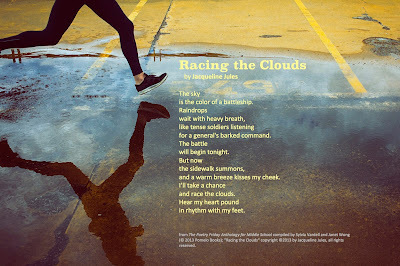 It might be an explicit connection— a poem about the sun to go with an image of the sun—or it might be a more abstract connection, such as a poem about summer fun, day vs. night, or warmth and caring. Work together to create your own collaborative anthology of images and matching poems. 3. 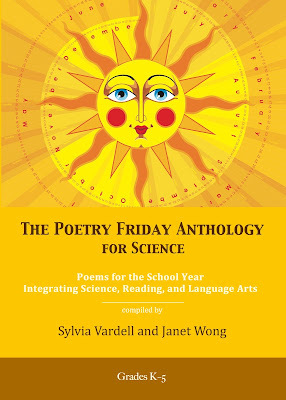 Many of the science-themed poetry books mentioned here weave together poetry, prose, and art. Challenge children to work in trios to research a science topic of their choice. Then allow them to choose their role for the next step: who will write the explanatory prose paragraph? Who will write the poem? Who will create the accompanying illustration? Afterward, talk about each role and discuss which they find easiest or hardest and why. Invite them to challenge themselves by taking on one of the OTHER roles next time and talk about how each information source is valuable and unique: prose, poetry and art. 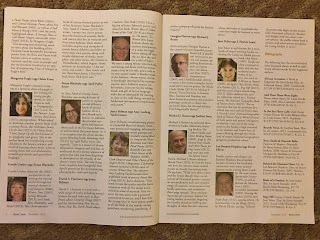 Finally, the article also includes a comprehensive bibliography of science poetry books, too including all the books by these poets and "tagged" by them too. 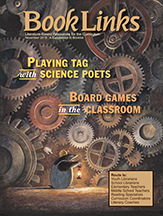 Click HERE for the link to the whole piece in BOOKLIST QUICK TIPS (March, 2016). 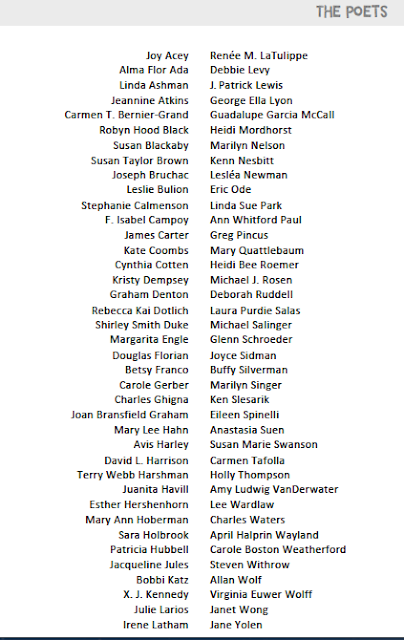 And I have a science poetry project of my own (that includes many of these poets, of course) that I'm very excited about and will share more news about that on Dec. 1. Stay tuned! Meanwhile, join the Poetry Friday crew over at Write. Sketch. Repeat. hosted by Katya Czaja. See you there! I love Halloween! I love making costumes and trick or treaters and candy and skeletons and pumpkins! Living in Texas, I also enjoyed discovering the tradition of the Day of the Dead-- a time to remember those we love who are no longer with us (thinking of you, Dad, Oma, Opa, Julia, Izell, Monte, Lettie). So, I was happy that we featured a poem about the Day of the Dead by our very own Texas author, René Saldaña, Jr., in this year's Poetry Friday Anthology for Celebrations (Pomelo Books, 2015). On top of that, my talented collaborator, Janet Wong, tried her hand at making a poem video for this poem which you can view by clicking HERE. 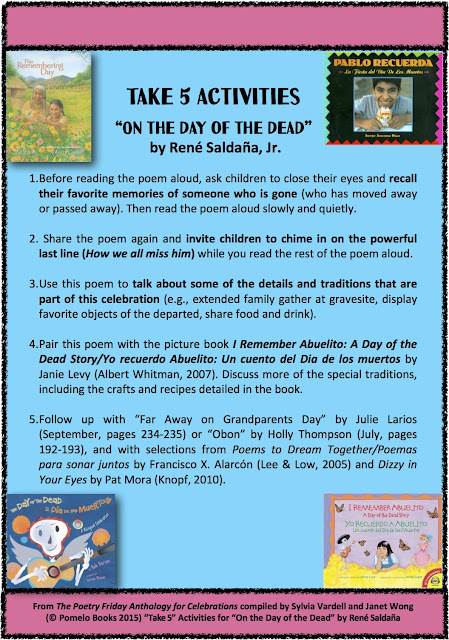 Here is the poem in English AND Spanish along with the Take 5 activities to guide you in sharing this poem. Enjoy! Now head on over to Check it Out where Jone is hosting our Poetry Friday gathering here. 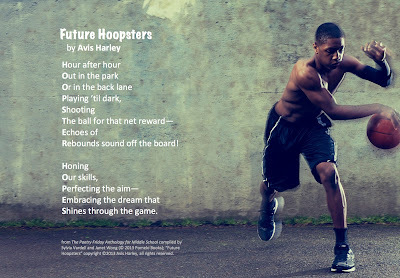 Here's the final poem in my series for Teen Read Week on the theme "Get Away @ the library" to spotlight all the great resources and activities available to help teens build literacy skills while reading for the fun to it. 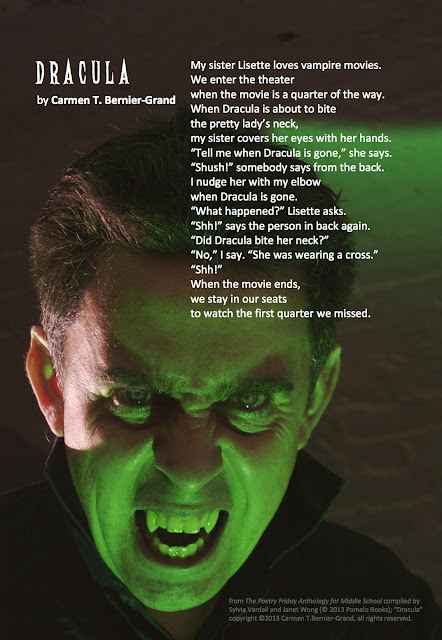 It's also a great poem for celebrating Halloween next week! It's "Dracula" by Carmen T. Bernier Grand from The Poetry Friday Anthology® for Middle School (Pomelo Books, 2013). You can also find it at Pinterest here. 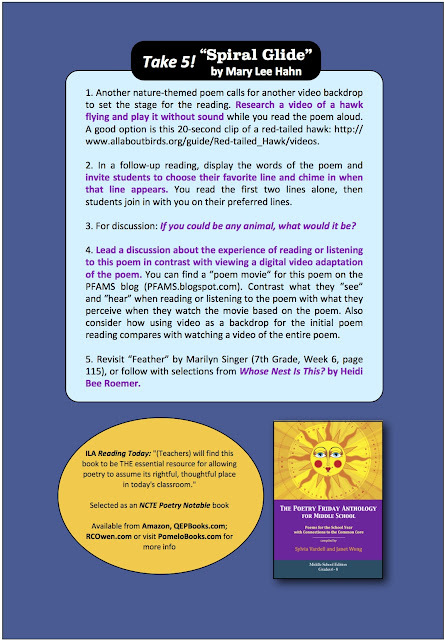 And here are the "Take 5" activities for sharing this poem also available at Pinterest here. 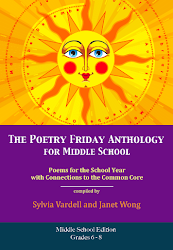 If you haven't gotten your copy of The Poetry Friday Anthology® for Middle School, it's not too late! 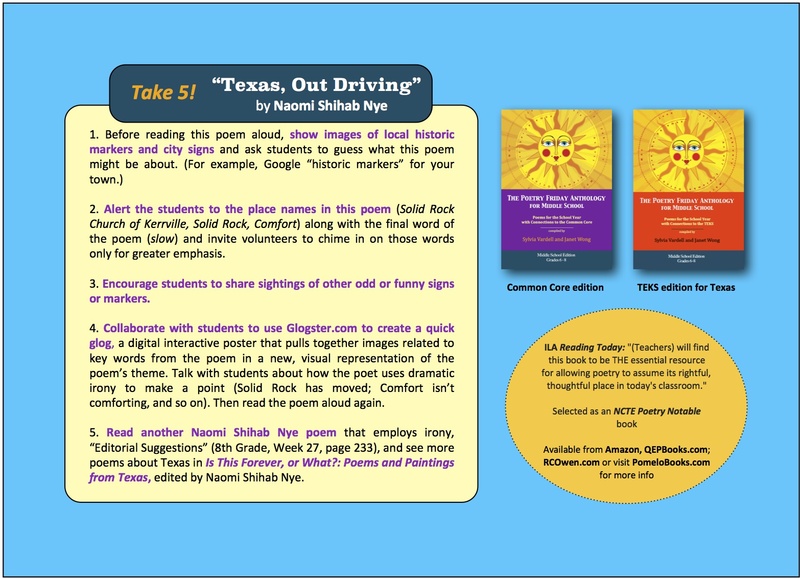 It includes 110 poems by 71 poets along with "Take 5" mini-lessons for each and every poem tied to the Common Core skills (and/or TEKS in Texas) for each grade level, grades 6, 7, 8. Now head on over to Jama's place to celebrate Poetry Friday. She always has a yummy treat for us! Teen Read Week continues with the theme "Get Away @ the library" to spotlight all the great resources and activities available to help teens build literacy skills while reading for the fun to it. 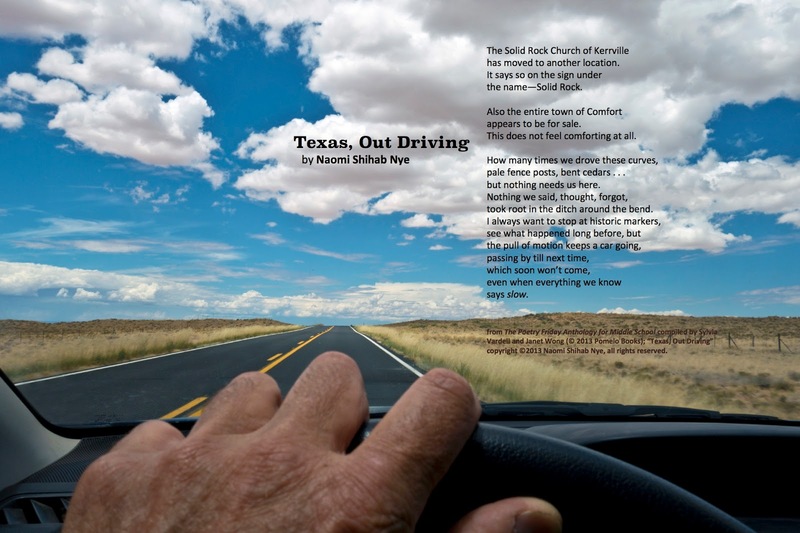 Today, I'm sharing "Texas, Out Driving" by Naomi Shihab Nye. Yes, I live in Texas, so of course I love this poem, but I think you will too. Who doesn't love Naomi's lovely, lyrical, intelligent, compassionate poems? 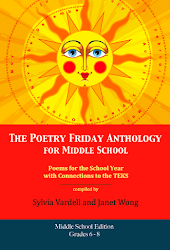 I'm so proud that this one is featured in The Poetry Friday Anthology® for Middle School (Pomelo Books, 2013). You can also find this poem graphic at Pinterest here. 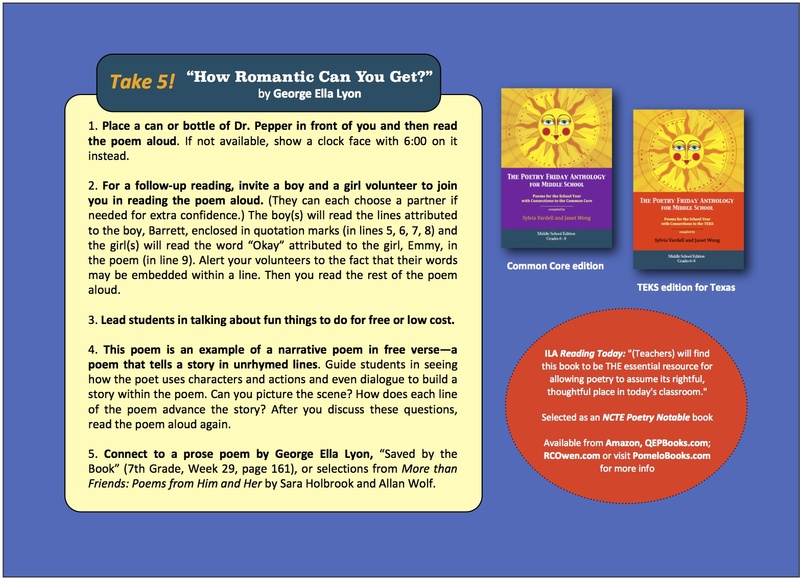 If you'd like ideas about how to share this poem with teens and tweens, try these "Take 5" activities from The Poetry Friday Anthology® for Middle School. This graphic is also available at Pinterest here. Here's the fourth poem in my series for Teen Read Week on the theme "Get Away @ the library" to spotlight all the great resources and activities available to help teens build literacy skills while reading for the fun to it. 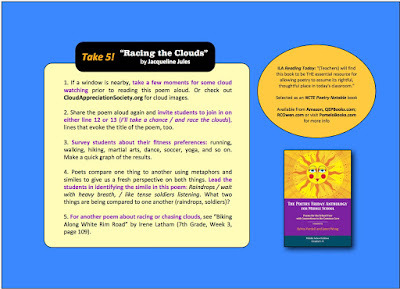 It's "Racing the Clouds" by Jacqueline Jules from The Poetry Friday Anthology for Middle School (Pomelo Books, 2013). You can also find it at Pinterest here. And here are the Take 5 activities that accompany this poem. The Pinterest link is here. Here's the fourth poem in celebration of Teen Read Week and the theme "Get Away @ the library" which is intended to spotlight all the great resources and activities available to help teens build literacy skills while reading for the fun to it. 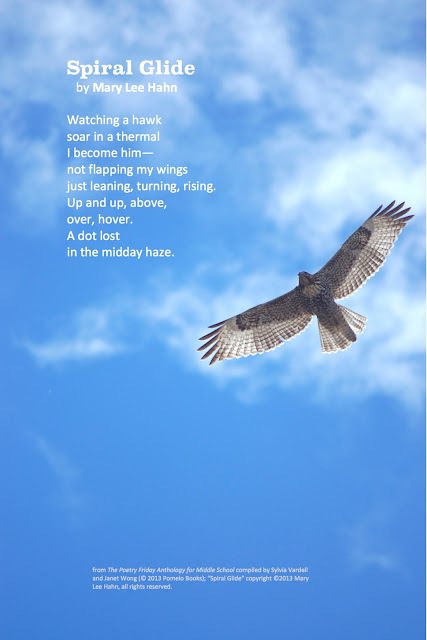 Share this thoughtful poem, "Spiral Glide" by Mary Lee Hahn from The Poetry Friday Anthology for Middle School (Pomelo Books, 2013). You can also find it at Pinterest here. 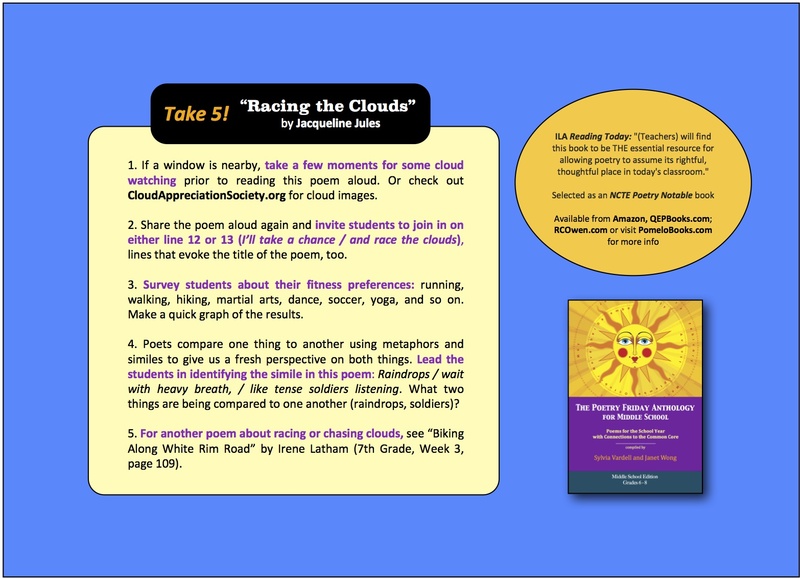 And here are the Take 5 activities that accompany the poem. 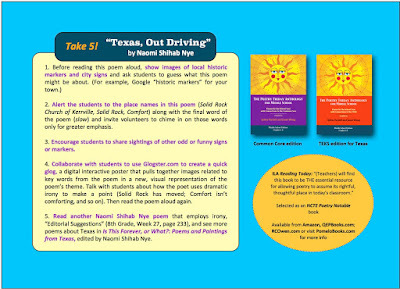 The Pinterest link for the Take 5 activities is here. Here's the third poem in my series for Teen Read Week on the theme "Get Away @ the library" to spotlight all the great resources and activities available to help teens build literacy skills while reading for the fun to it. 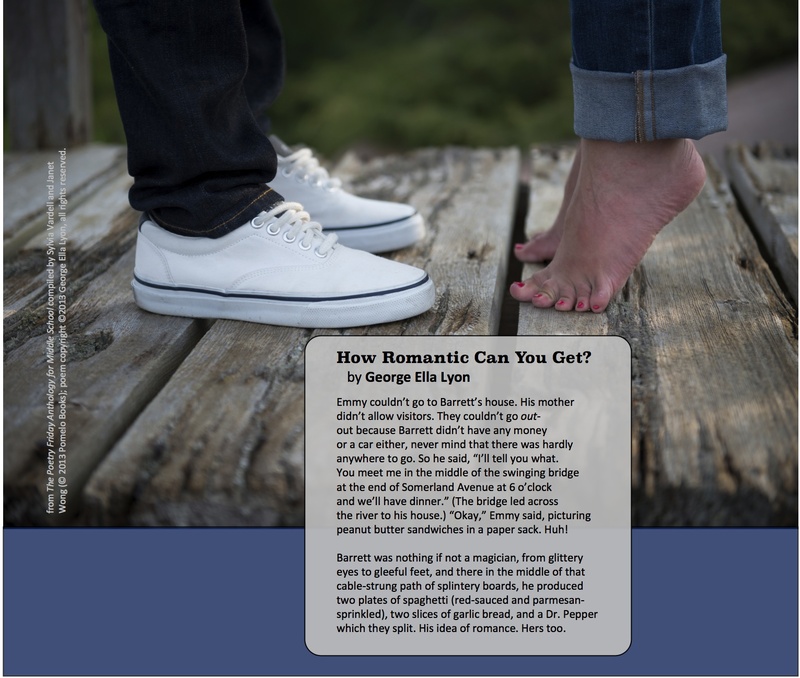 It's "How Romantic Can You Get?" by George Ella Lyon from The Poetry Friday Anthology for Middle School (Pomelo Books, 2013). You can also find it at Pinterest here. 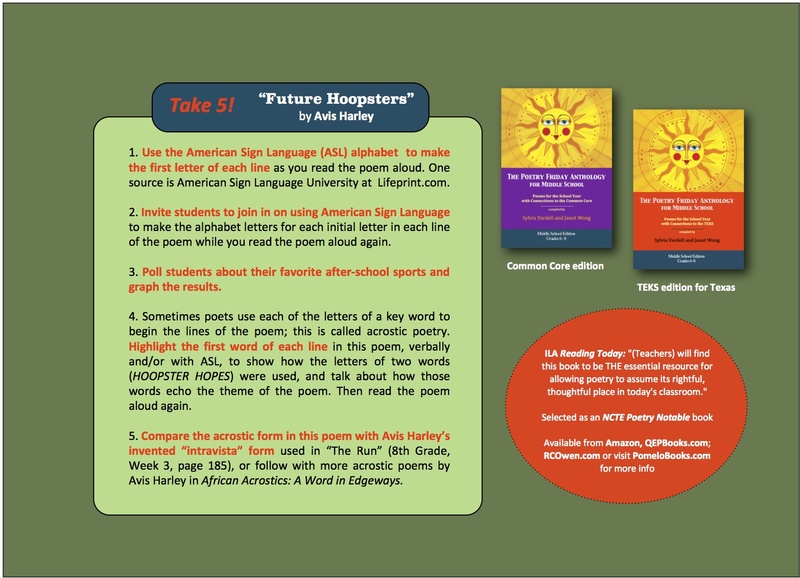 And here are the Take 5 activities from the book also available at Pinterest here. It's time for our second installment in our poems for Teen Read Week and the theme "Get Away @ the library" to spotlight all the great resources and activities available to help teens build literacy skills while reading for the fun of it. Here's "Future Hoopsters" by Avis Harley from The Poetry Friday Anthology for Middle School. It is also available at Pinterest here. And here are the "Take 5" activities that accompany the poem, also at Pinterest here.